Our very versatile Adventure Look Out Tower is another playground idea from our Adventure Play series. 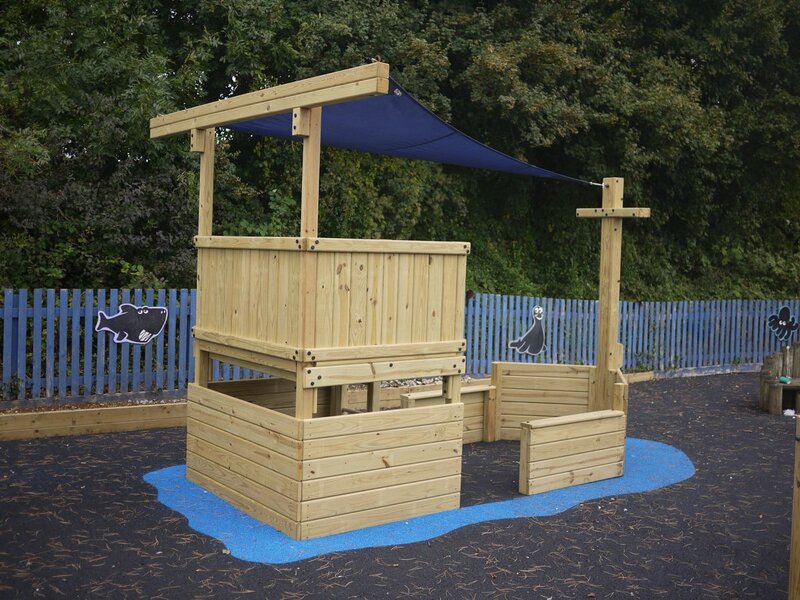 The Look Out comprises of a hexagonal deck at 1.5m (we can also do this at different heights (depending on the age groups) and this gives you the chance to add up to six accessories to maximise the play value within a limited footprint. And because the Look Out deck is so large, you are not going to get overcrowding with all the climbing and sliding activities. For an even more impressive playground, connect the Look Out Tower to other structures such as our Adventure Fort or Jungle clubhouse. And just like our Adventure Forts, you can choose standard or battlement walls to add interest to the top deck. In standard form the Adventure Look Out comes with three top walls allowing three spaces for accessories – but you can have more accessories up to the maximum of six, or increase the number of walls to make it more enclosed at the top. Above are a couple of suggestions. From left, the central mini turret with ladder access, splayed cargo net going up to the top rail, full height rock wall. Like all the Home Front range of commercial play equipment, the Adventure Look Out is supremely versatile with a huge choice of accessories and variations. For example, an additional option is a central mini tower with ladder access from the ground, and of course you can put walls around the base to create another play area. If you are looking for something else, please take a look at our Forts and Ships.